In our exclusive interview with Alvin Leung back in August, the “Demon Chef” announced that he would be unveiling two new openings before the end of 2017. 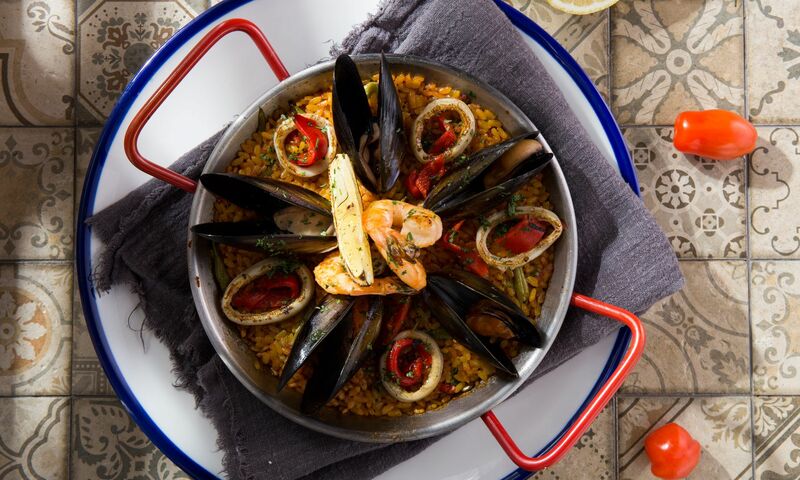 Plato86, a Spanish restaurant, is the first, which quietly opened its doors at Brim 28 in Wan Chai. Unlike the rowdy happy hour bars along the strip, Plato86 is far more understated when it comes to its looks, but the restaurant has potential to offer more. Passing the al fresco entrance into the main dining space, you’ll find that Plato86 is simple in its décor. The white furnishings gave the space a light and fresh ambiance during the day but this pleasant vibe somehow diminishes at night as it transforms into a dimly-lit dining room. The food menu is a simple one-pager, dividing dishes into categories from ‘raw bar’ to ‘ceviche and crudo’ and ‘paella’. What caught our attention was the extensive and affordable tapas from the menu. We began our meal with fried padron peppers. Served battered and deep-fried, the golden crust was thin but mildly seasoned, adding a spicy touch to the sweet green peppers. Fried calamari and fried aubergine and honey both benefited from their thin crusts, and the calamari is particularly tender, while a light drizzle of honey added sweetness to the aubergines. Vegetable croquettes may appear unevenly cooked as some had turned darker than the others, but each of these deep-fried morsels was packed with chopped vegetables, bound together by a creamy sauce. The Iberico meatballs, however, were a bit on the dry side despite a fresh tomato sauce served alongside. While a Valencian paella was the first item that caught our attention, it was the squid ink pasta that won our hearts. Presented in the same manner as the paella, the team at Plato 86 prepared fregola pasta grains in the same way as they do with rice in a paella. These chewy pasta grains are evenly spread over the base of the paella pan, which helps to build a thin crust underneath. The miniature ringlets of squid were fresh and matched the rest of the dish. The selection of mains are scarce, but the grilled suckling pig was a surprise hit—the ultra-thin skin was crispy while the meat stayed tender throughout. Iberico meatballs, like other tapas at Plato86, are best for sharing. The wine list offers an abundance of beverages, from wines by-the-glass to the quintessential sangria. We opted for both white and red sangria; the white version was fruitier and served cooler. The wine list was a fine read, pinned on a long wooden plank. Service is personal and helpful from the minute we set foot in the restaurant, and the service team has been proactive in describing the restaurant’s concept and introducing daily specials. Service was friendly and we were rather impressed with the staff’s deep understanding of the menu and wine pairing knowledge, which comes in handy for wine novices.